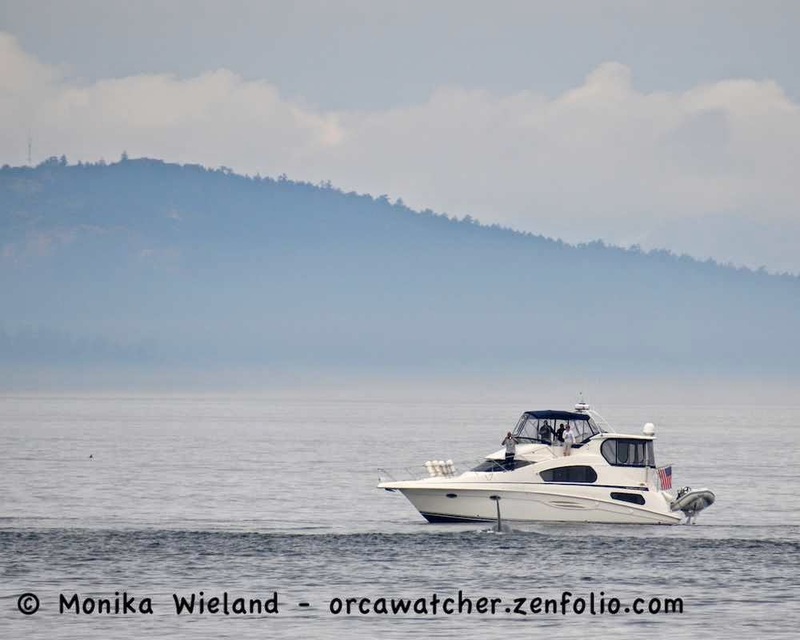 Being the end of a holiday weekend, there were a lot of private boaters out on the water. Thankfully, most of them were pretty respectful, and either kept their distance or stopped when they realized there were whales. 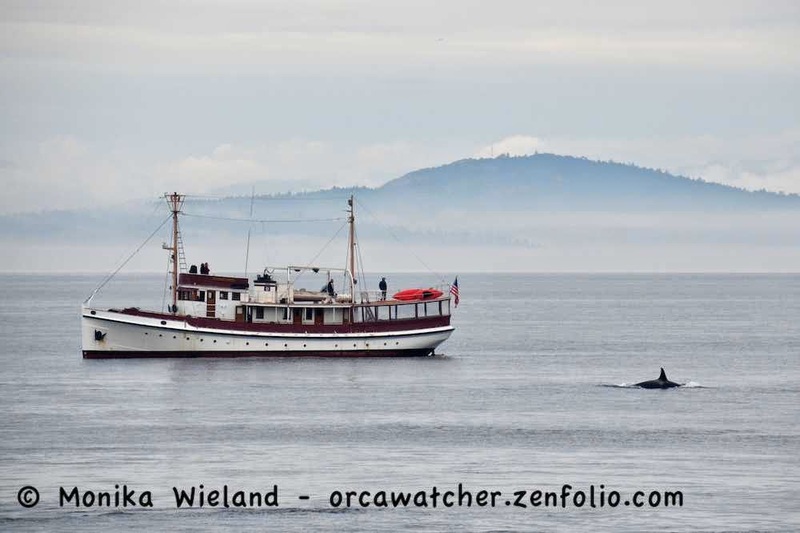 On several occasions, whales headed right for boats! Here's K26 Lobo approaching the classic yacht Summer Wind. Completed in 1940, she was commissioned to create the first modern nautical charts of the Aleutian Islands. She's now privately owned. And another example - L92 Crewser making a close approach to a private boat. 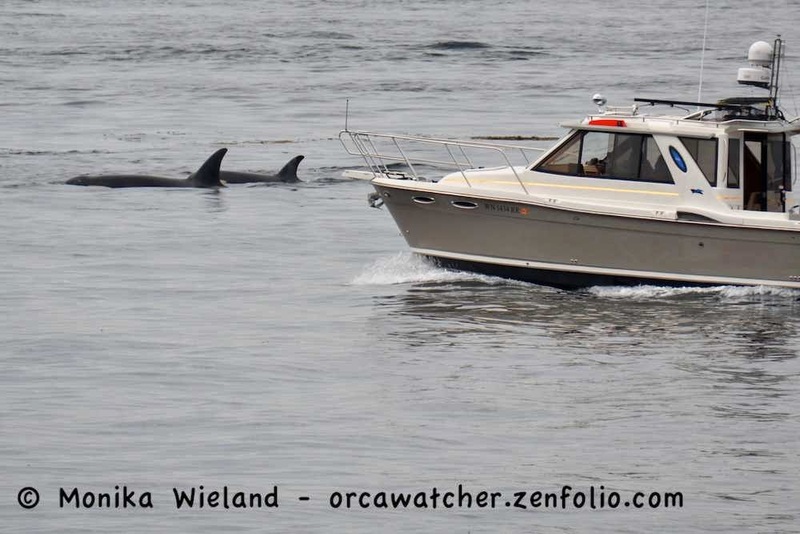 Look at the size of that dorsal fin compared to the boat (the fin is the black line about a third of the way down the length of the boat)! Of course, not all the boaters were respectful. 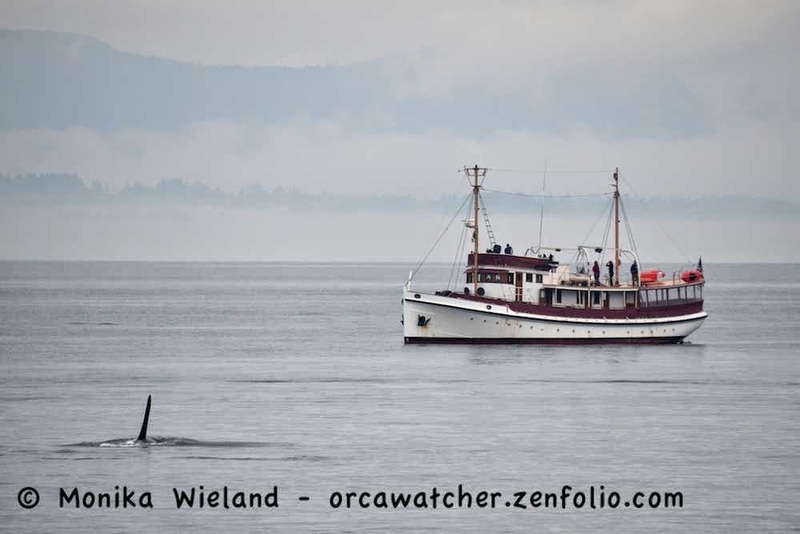 This one went cruising a full speed right through the whales. It's hard for us humans to watch, unable to do anything. 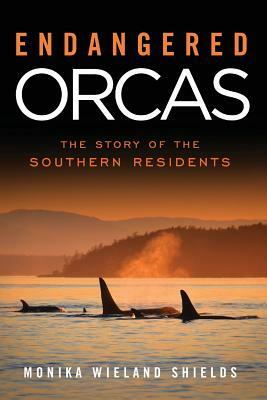 But it's also important to remember the whales' perspective may be entirely different from our own. 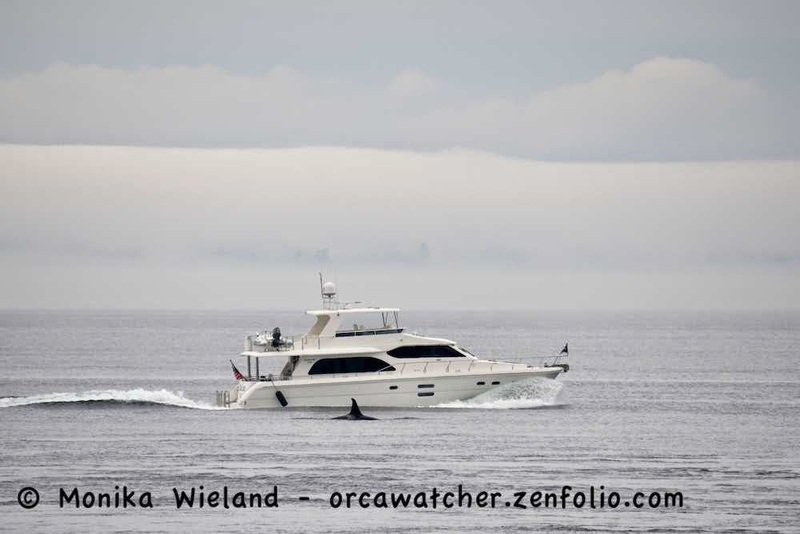 For instance, less than a minute after this photo was taken, L82 Kasatka was surfing the wake of this yacht, seemingly having a grand ol' time. It was interesting to watch what happened next. While the whales had been all mixed up, it was like they suddenly decided it was time reorder themselves, perhaps because the groups were about to split. Everyone had to go back and find their family group, which meant for some time there were whales traveling every which direction. 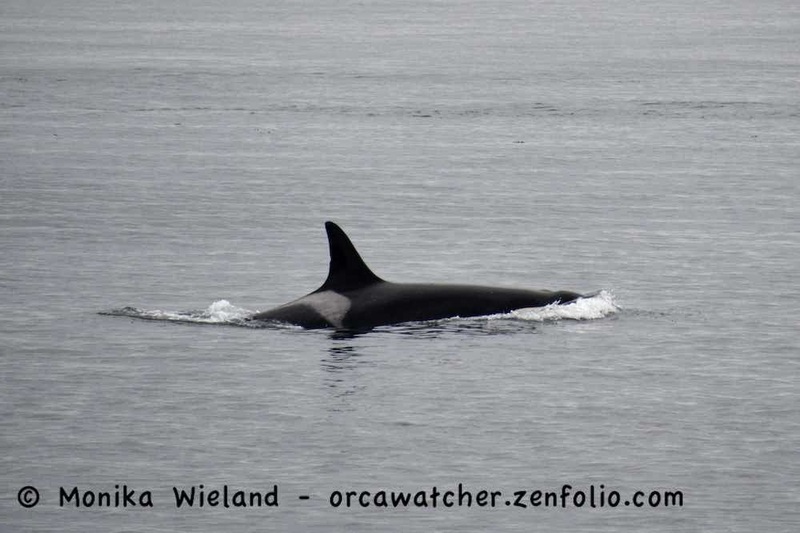 For example, while the L-Pod whales who had gone north went to join the others in the south, part of J-Pod stayed up north. At the same time, the J16s, who typically travel with Granny's group, emerged from the south and headed up north to meet up with those Js. Sound confusing? It kind of was! It was hard to figure out who was going where, but as I said, I'm pretty sure it was everybody "unshuffling" themselves - something that I've never actually seen unfold before! While all this was going on, though, there was one boy who didn't want to say goodbye to his pal. 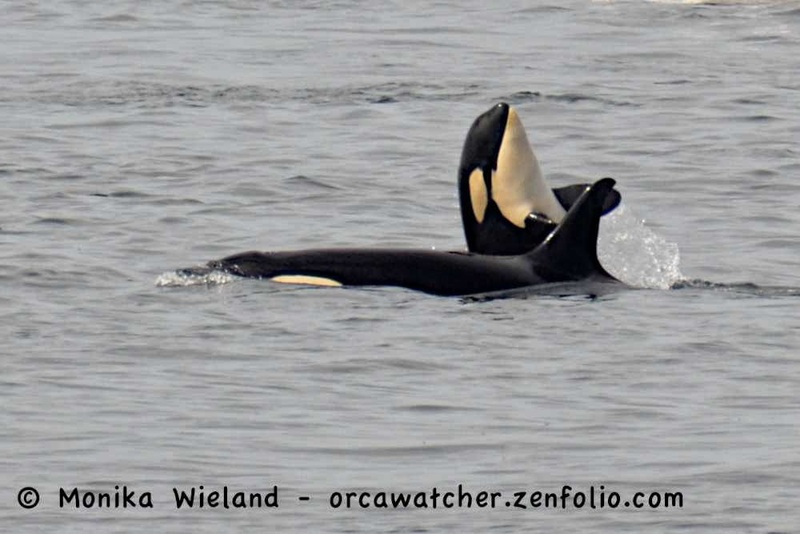 As J36 Alki tried to follow her family north, L105 Fluke did not want to let her go. At first I only knew it was a male that was hounding her, and couldn't figure out who, because he would only surface upside down, with sea snake in full view! At first she seemed to be evading him, but then she apparently gave in, as they rolled around together and he lifted her up out of the water. What was a bit surprising to me is that while Alki is potentially of breeding age at 15 years old, Fluke is a bit young to be playing the love interest at the age of 10. (It's not uncommon for juvenile whales to engage in sexual play, however.) But hey, I guess in the whale world, anything goes! Apparently, a parting was soon imminent, as the groups did split, and Ls would leave the following night, taking some of the other whales with them. 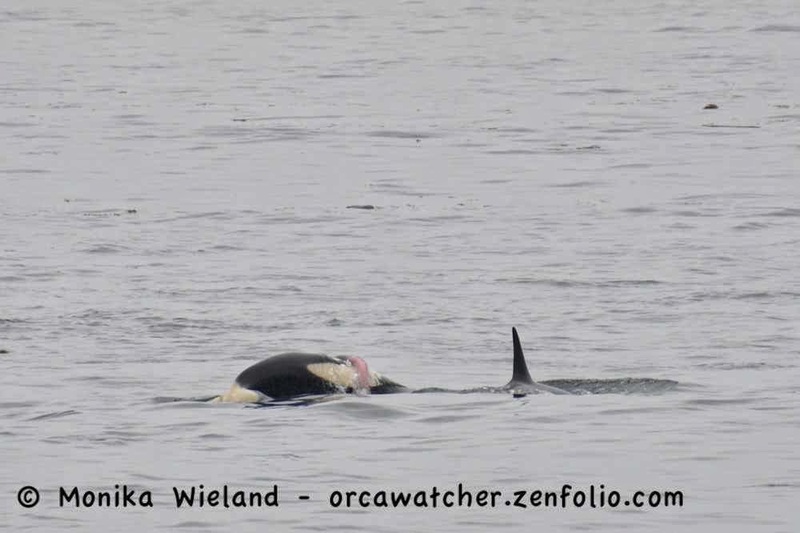 It's been getting hard to keep track, as after a day of no residents in inland waters, we ended up with part of J-Pod and part of K-Pod here! More on that in the next post.